Strong north-westerlies, not expected to produce many migrants here, lived up to their unpromising reputation: barely a new bird was to be found besides Meadow Pipits, of which a count of 197 was the highest since the spring. At least 7 White Wagtails were around and a long-staying Barred Warbler was the only scarcer species seen. Kittiwakes don't nest on North Ronaldsay, but the concrete pier provides a close approximation of their preferred cliff-ledge habitat and small numbers often gather there at this time of year. Opening the mist nets made a productive start to the day, with the first Redstart of the autumn and a Sedge Warbler trapped, as well as a remarkable 4 Barred Warblers. Of the latter species, 2 had been ringed here mid-month, but the other 2 were new birds. The rest of the day was less eventful, producing just 2 Garden Warblers, 3 Willow Warblers and 14 Swifts of note. ...hope that soon faded during a surprisingly quiet census on the 28th, with 4 Willow Warblers and 5 White Wagtails the most interesting new passerines. A Barred Warbler was still present, a Merlin and a Peregrine were seen and 7 Swifts took refuge at the lighthouse when heavy rain returned in the evening. At least 2000 Fulmars passed south down the island's west coast during the morning, and 3 Sooty Shearwaters, 2 Manx Shearwaters and a Storm Petrel were seen from the hide. The highlights of a fairly uneventful day's birding on the 25th came from the seawatching hide, from which 2 Pomarine Skuas, 2 Sooty Shearwaters, 7 Manx Shearwaters and 5 Storm Petrels were seen passing the island. On land, a Lesser Whitethroat and Reed Warbler were the only noteworthy new arrivals and a Barred Warbler was still at Holland House. An even quieter 26th had little besides yet another new Reed Warbler, a couple of Peregrines and a long-staying Barred Warbler. Perfectly calm weather is unlikely to bring big falls, but small numbers of migrants might always stop off on the island in such conditions. On this occasion a very sparse smattering of new passerines consisted of a couple of Pied Flycatchers, a Whinchat, a Goldcrest, 3 Garden Warblers, a Lesser Whitethroat and a Reed Warbler, and a total of 10 Willow Warblers were seen. Scarcities hanging on from earlier days were the Common Buzzard, a Wryneck, 2 Barred Warblers and the Ortolan Bunting, and the year-list gained its 190th species courtesy of an adult Pomarine Skua. Other sightings included a noticeable increase in Redshanks, reaching 108 individuals, a Hen Harrier and a Merlin. The previous day's migrant clear-out continued overnight, a general passerine exodus leaving very little behind for the morning census. 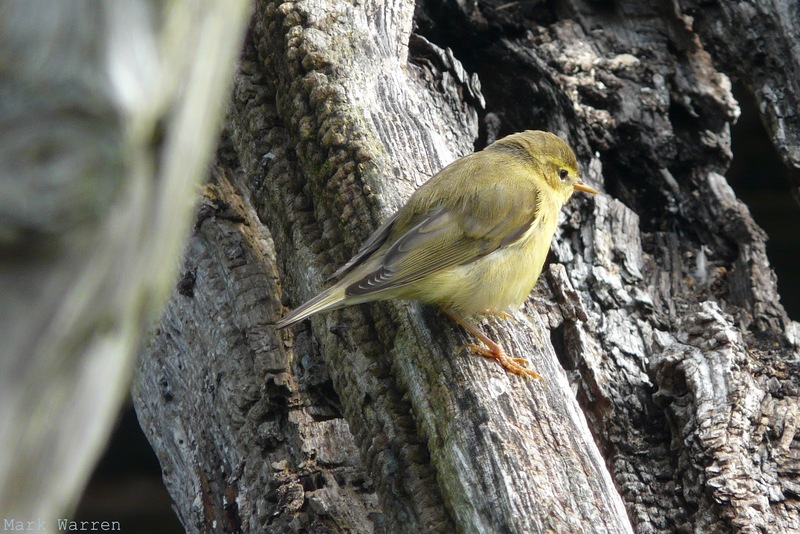 A couple of Barred Warblers included a new bird ringed at the observatory and a Wood Warbler remained at Holland House, but other small migrants numbered just 2 Willow Warblers and a Garden Warbler. At least 29 Swifts came through during the morning, and some raptor interest was provided by a Hen Harrier, a Kestrel and - the bird of the day - a Common Buzzard that appeared near the observatory in the afternoon. A small number of new birds were noted during the morning and a few scarcities were hanging on from past days, but there was an obvious clear-out of some of the common species and a definite net decrease in migrant numbers. The Ortolan Bunting showed itself once again at Holland House, where 3 Barred Warblers and a new Reed Warbler were lurking amid the fuchsia. Another new Barred Warbler was found in the afternoon, 2 Wood Warblers were fresh migrants and a Merlin, a Goldcrest and a Siskin were all species making their first appearances of the autumn. A Red-backed Shrike at the north of the island was assumed to be the bird seen in the same spot six days earlier, and counts of remaining common migrants included 4 Whinchats, 4 Lesser Whitethroats, 4 Garden Warblers and 18 Willow Warblers. A quieter day on the whole still had a few decent birds and a nice range of species. 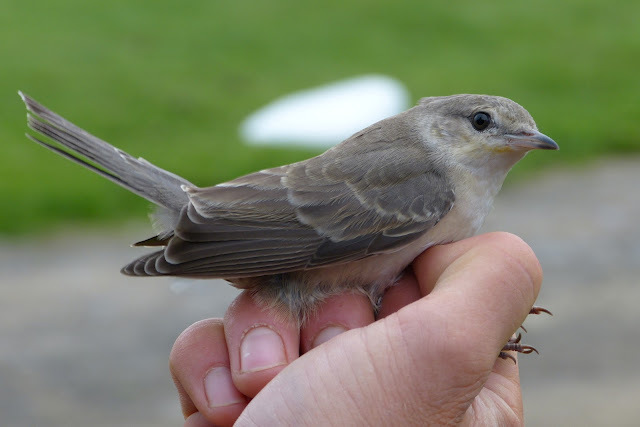 A Barred Warbler and a Reed Warbler at Holland House were both ringed birds from earlier in the week, while counts of 26 Willow Warblers, 3 Garden Warblers, 3 Lesser Whitethroats, 8 Whinchats, 3 White Wagtails and 1 Pied Flycatcher were largely comprised of other non-movers. A Yellow Wagtail on the golf course and a couple of flyover Crossbills were notable new arrivals, and an increase to 71 Wheatears indicated an influx of the species. Non-passerines included the first Pintail and Gadwall for some time among noticeably swelling wildfowl numbers, a Hen Harrier, 5 Swifts, 3 Green Sandpipers, the same Wood Sandpiper and 4 Greenshanks. The excellent start to the autumn continued with another bright day and some more quality migrants. The morning kicked off in style with a fleeting Golden Oriole at Holland House that flew straight out of the sycamore canopy and was not seen again. This is only the eighth record of the species here, and the first since 2005. All the previous birds have been in spring. The day's other star bird was an Ortolan Bunting found at Garso in the afternoon. Although a regularly occurring visitor in the 1990s, Ortolans have been much less frequent in recent.years. 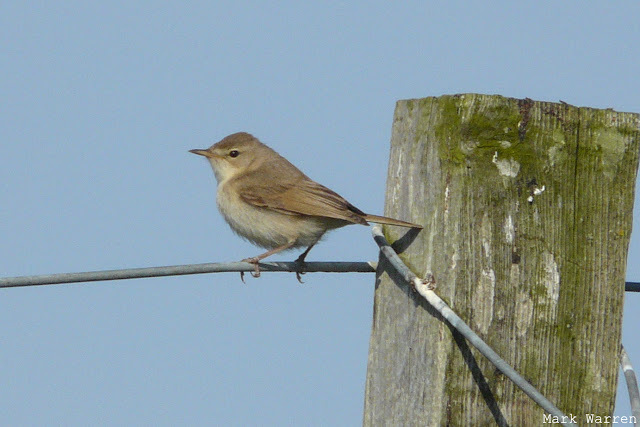 A lot of the other migrants seen on census were probably birds from earlier days, but counts came to 29 Willow Warblers, 2 Chiffchaffs, 3 Garden Warblers, 5 Lesser Whitethroats, 2 Barred Warblers, 5 Whinchats, 1 Black Redstart, 1 Pied Flycatcher and a Wryneck. A couple of Sand Martins and 5 Swifts were seen, and a Wood Sandpiper and 9 Common Sandpipers remained among a good variety of waders. It was a much quieter day with migrant passerines noticeably reduced than of late with a different fly-over flava wagtail the only definite new arrival. There were still 2 Barred Warblers in Holland House gardens, plus 4 Lesser Whitethroats but just 21 Willow Warblers were counted on the Island. 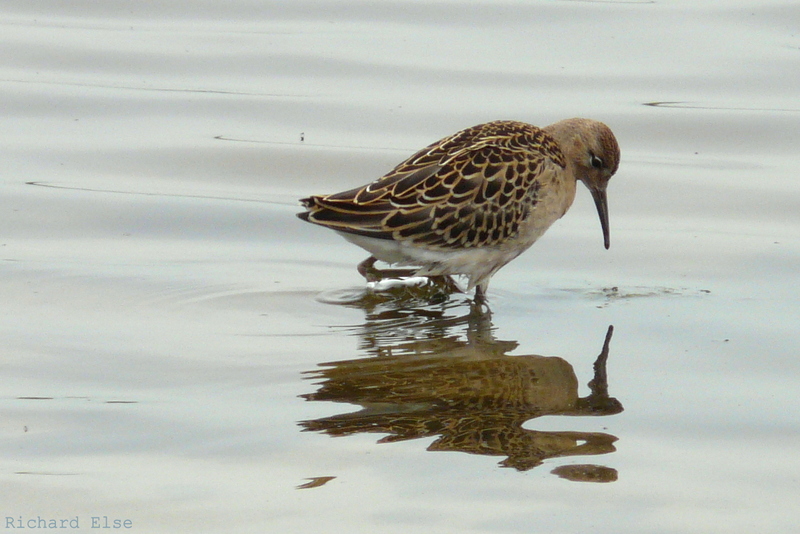 Lingering waders included the Wood Sandpiper, a Black-tailed Godwit and at least 23 Ruff. Another fine day with plenty of migrants with a flava wagtail, the first returning Grey Plover and 2 Tree Pipits the most notable of new arrivals. A Wryneck and a Wood Warbler near the observatory and 2 Barred Warblers were presumably hangers on, whilst other counts included 14 Ruff, a flock of 12 Black-tailed Godwits and 7 Common Sandpipers, with a Wood Sandpiper and 2 Greenshanks still on Gretchen Loch. Increased counts of passerines was most likely due to calmer conditions with increased totals of 5 Whinchats, 8 Lesser Whitethroats, 12 Garden Warblers, 53 Willow Warblers and 2 each of Grasshopper and Reed Warblers. A pleasant start to the day allowed opening of the mist nets at Holland House and a chance to find some of the skulking migrants that had been accumulating in the bushes during the previous day. A good number of birds were trapped and ringed, including a new Icterine Warbler and 2 Barred Warblers. Elsewhere, the first Wryneck of the autumn near Antabreck was quickly followed by another one outside the observatory, and the first Fieldfare was near Holland House. Migrant numbers were noticeably depleted, but counts from the day's census areas still reached 39 Willow Warblers, 1 Wood Warbler, 5 Lesser Whitethroats, 9 Garden Warblers, 4 Pied Flycatchers and 2 Whinchats before constant heavy rain set in for the afternoon. A couple of Sand Martins and 5 Swifts were seen, while waders included 21 Ruffs, 3 Greenshanks, 4 Common Sandpipers, a Green Sandpiper and a Wood Sandpiper. What a day. Once again, an excellent variety of common and scarce migrants was recorded, but the highlight was undoubtedly the Booted Warbler found at Westness in the afternoon. 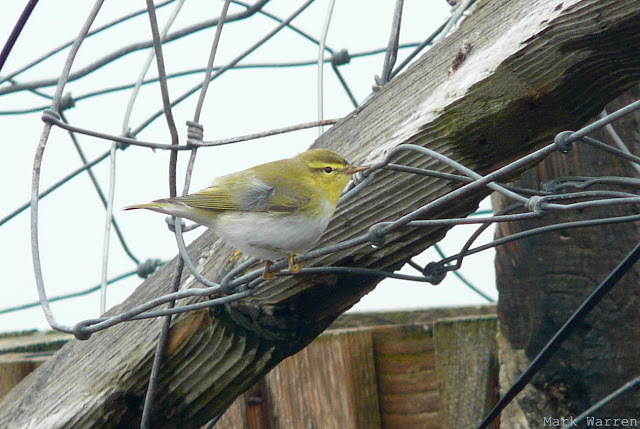 It spent much of the time feeding around the very same buildings that had hosted the Greenish Warbler a couple of days earlier, and was eventually trapped and ringed there in the evening. There is only one previous record of the species for the island. The autumn's first Icterine Warbler was at Nether Linnay in the morning, and at least 3 out of the 4 Barred Warblers seen were new in. A new Red-backed Shrike was at Scottigar and, more unexpectedly, a Corncrake was flushed at nearby Vincoin. Also notable were a Grasshopper Warbler and 4 Reed Warblers, while census counts of commoner small migrants included 97 Willow Warblers, 9 Garden Warblers, 7 Lesser Whitethroats, 6 Whinchats, 5 Pied Flycatchers and a Spotted Flycatcher. A count of 19 Common Sandpipers smashed the existing island record of 11, and 2 Wood Sandpipers, 3 Green Sandpipers, a Greenshank, 20 Ruffs and a Black-tailed Godwit were also noteworthy waders. In continuing favourable conditions, there were still good numbers of birds on the island, although a high proportion of non-movers from the previous day indicated little overall flux of migrants. Scarcities first: The Greenish Warbler remained at Westness all day, the Red-backed Shrike was seen near the post office and 2 Barred Warblers were trapped and ringed at Holland House. 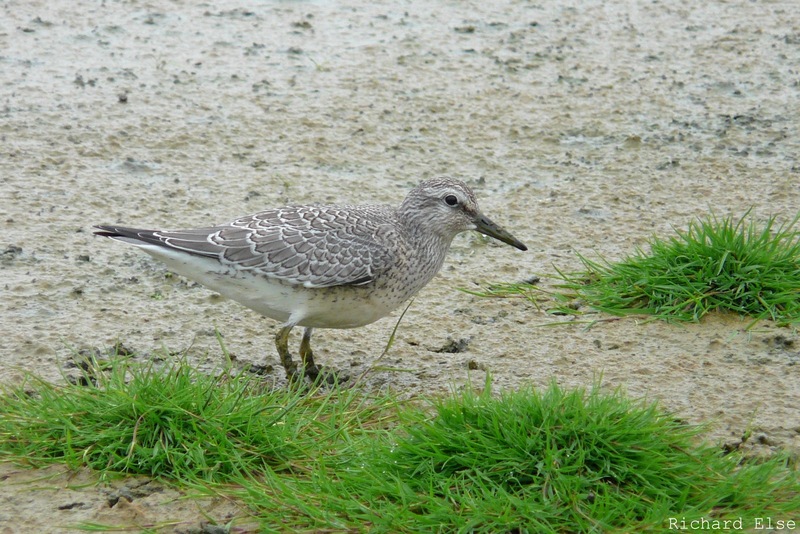 A Wood Sandpiper and a Crossbill were the most notable new arrivals. Counts of common migrants came to 4 Whinchats, 2 Lesser Whitethroats, 1 Whitethroat, 7 Garden Warblers, 32 Willow Warblers 2 Pied Flycatchers and a Swift. A Peregrine was seen in the afternoon, and 5 Grey Herons, 15 Ruffs, a Black-tailed Godwit, 3 Green Sandpipers and 6 Common Sandpipers were also logged. The first real fall of the autumn took place in miserable weather during the morning, strong winds and rain grounding passerines of various kinds on the island, particularly on the north and west coasts. 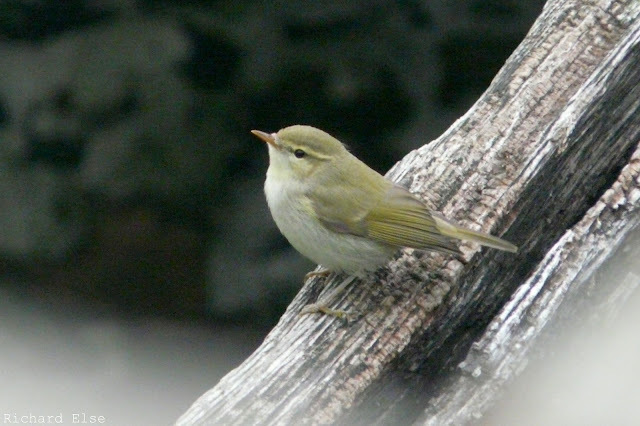 The day's highlight was a Greenish Warbler that was found around the derelict croft at Westness in the afternoon. 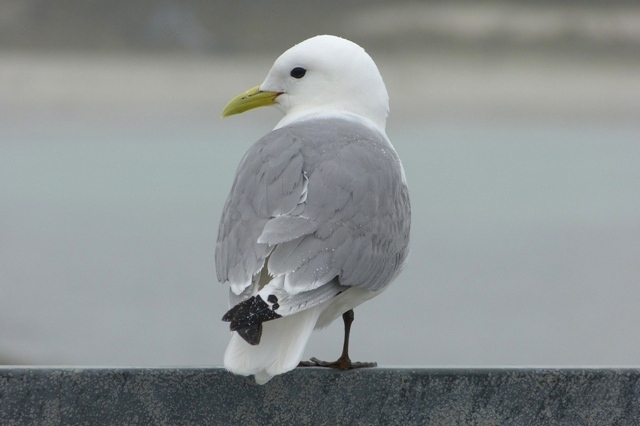 For a bird that is almost an expected feature of Northern Isles Augusts, it is surprising to find that this is only the seventh record of the species for the observatory. A Citrine Wagtail on the west coast was assumed to be the bird from a couple of days earlier. The autumn's first Red-backed Shrike was ringed at Holland House in the evening, and 4 Barred Warblers provided further scarcity interest throughout the day. 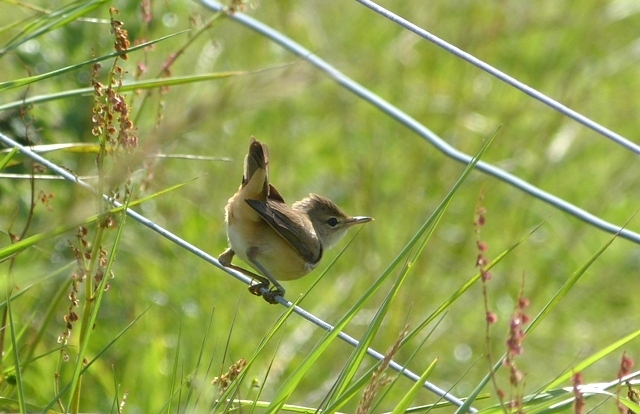 Other warblers included 3 Wood Warblers, a Lesser Whitethroat, a Reed Warbler, 13 Garden Warblers and 42 Willow Warblers; a Black Redstart, a Whinchat, 4 Pied Flycatchers and 4 White Wagtails were among the other passerine sightings. A count of 19 Whimbrels was a notable increase, 10 Common Sandpipers was only just shy of the species' highest ever day-total, a couple of Swifts were seen and 4 Grey Herons arrived from the south. A few more migrants began to trickle in on the strengthening easterlies. 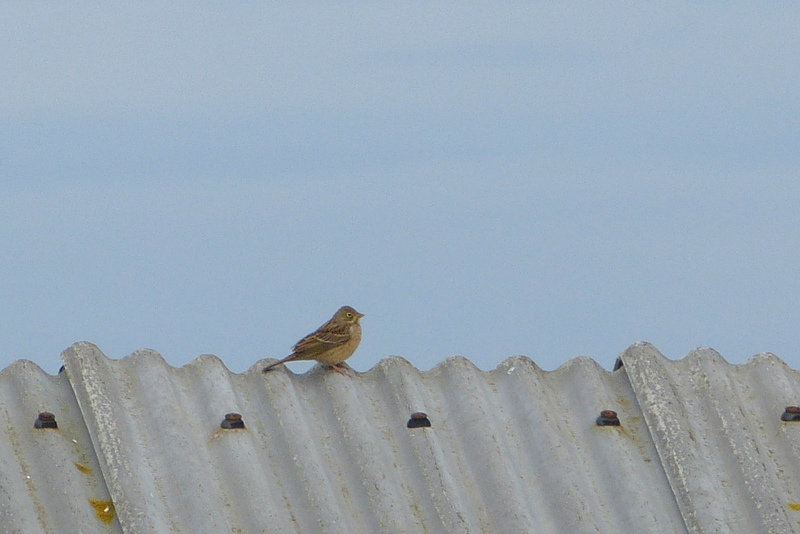 The first Barred Warbler of the year was at Holland House, and other passerines included 3 Whinchats, a Garden Warbler, 7 Willow Warblers and the long-staying Black-headed Bunting. A couple of Greenshanks and 3 Green Sandpipers were the best of the waders. 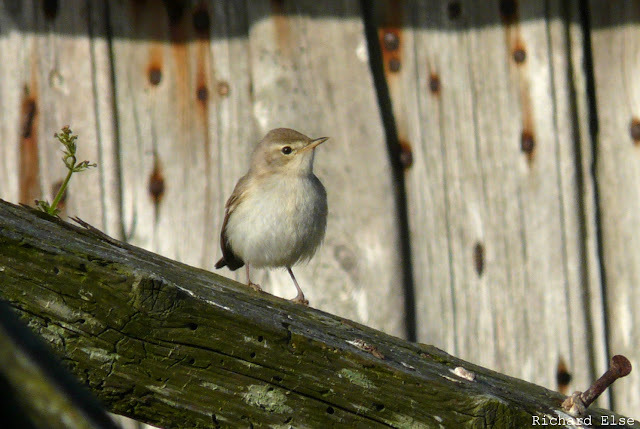 With winds in the east, a few migrants were anticipated to appear as the day progressed. By midday, though, the only bird movement of interest involved waders. A count of 42 Snipe included various flocks arriving or departing out to sea, 11 Black-tailed Godwits were seen and 2 Greenshanks and a Green Sandpiper were still around. 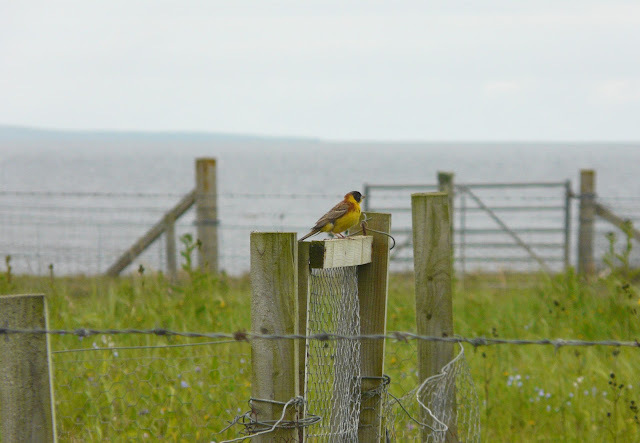 The first passerine migrant, found early in the afternoon, was a flighty Citrine Wagtail at Garso Loch. It was subsequently tracked to Ancum Loch, where it was eventually seen well on the ground. 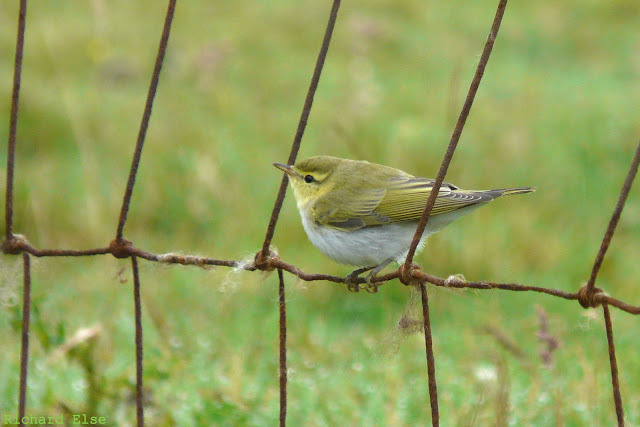 Birds were presumably arriving later in the day, with 4 Willow Warblers seen in the evening. The Black-headed Bunting was still near Holland House, and other sightings included a couple of Kestrels and a Manx Shearwater. A good variety of waders includes several small flocks of Knots. There was little to report from the land besides the Black-headed Bunting, 11 Ruffs and 2 Black-tailed Godwits. A short seawatch produced a Sooty Shearwater, 5 Manx Shearwaters, 4 Storm Petrels and 1,752 Puffins. A Kestrel was new on the 9th, while a couple each of Greenshank and Green Sandpiper were still present and Ruffs increased to 10. There were 13 of the latter species on the 10th, and a flock of 10 Black-tailed Godwits arrived from the north. A couple of Grey Herons and a male Hen Harrier also arrived, at least 2 White Wagtails were among the Pieds, a Chiffchaff was at the north of the island and the Black-headed Bunting was seen again briefly as another period of fog rolled in for the evening. 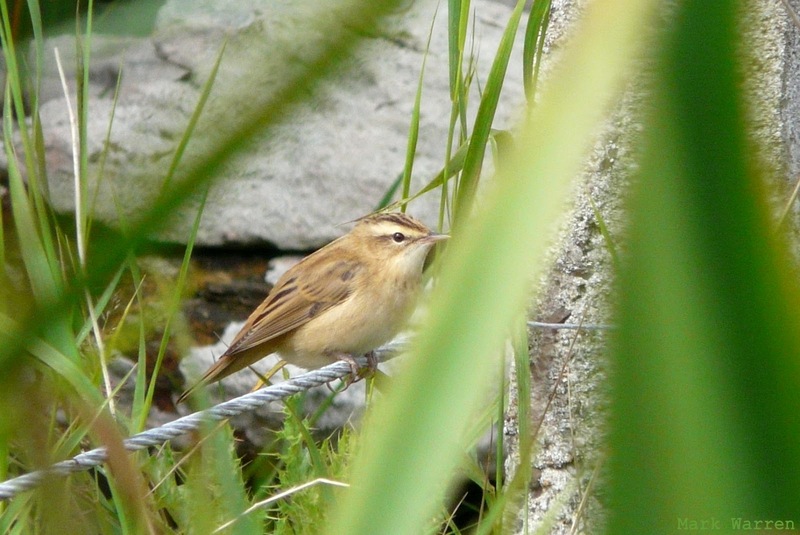 Sedge Warblers have been more conspicuous than usual recently, although all sightings probably just involve the island's breeding birds and their offspring. There was no sign of the Black-headed Bunting around the observatory on the 7th, but it was relocated near Holland House the following day. A few of the less common waders continued to feature, with 6 Ruffs, 2 Black-tailed Godwits, 3 Greenshanks and 3 Green Sandpipers present on the 8th. The only other migrants of note were 3 southbound Grey Herons on the 7th and a juvenile Peregrine on the 8th. The Black-headed Bunting was still present in the Observatory crop fields during the morning but like yesterday, it wasn't seen in the afternoon. A Willow Warbler at the north end was the first of the autumn and also seen today were a Ruff on Bewan, 4 Greenshanks and a single Green Sandpiper. A count of 322 Turnstones was the highest of the autumn so far and included the first juvenile birds. The 4th was largely uneventful with just singles of Green Sandpiper and Greenshank remaining from previous days. Another 'Storm Petrel' ringing session overnight resulted in 35 birds trapped and ringed. A Leach's Petrel was also seen and heard while a single Dunlin was also caught. After a lie-in on 5th, birding staff were quickly rushing from their beds (some only partially dressed!!) 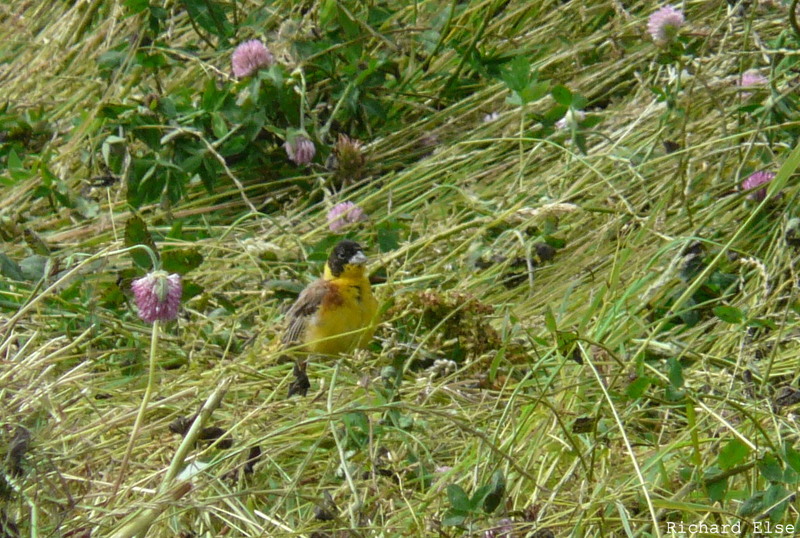 when a stunning male Black-headed Bunting appeared outside the Observatory. It spent a couple of hours in the company of the local House Sparrows and Linnets, actively feeding in the crop fields before vanishing at lunchtime. This is the eighth record for the Island, but the first since 2003. A juvenile Peregrine was also seen, arriving from the south and there were now 2 Greenshanks and 2 Green Sandpipers on Gretchen, while 5 Swifts also lingered in the same area. A stubborn fog, impervious to the navigation technology of the regular inter-island aircraft, smothered North Ronaldsay for two days of minimal visibility and forced Olympics viewing. When the mist did eventually clear for a spell during the afternoon of the 3rd, a nice selection of new waders had somehow found their way here through the caliginous conditions: at least 3 Green Sandpipers and 2 Greenshanks were present, and a minimum of 4 Ruffs had arrived. Most surprisingly, a Nightjar flew out of Holland House garden pursued by the agitated local swallows, although it was almost certainly the same bird from earlier in the week. The smallest hours of the 31st were spent at the north end of the island ringing Storm Petrels. Small numbers of Arctic Terns were still active around Bewan Loch, and 7 full-grown birds were trapped and ringed along with the petrels. 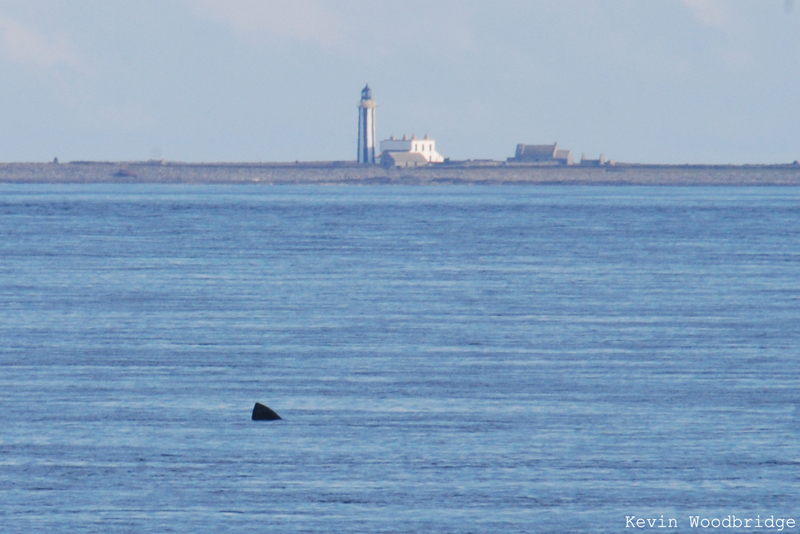 A Greenshank was still around once the sun came up, but the highlight of the day was a pair of Basking Sharks that drifted past the oservatory in the evening. Basking Shark in the North Ronaldsay Firth, with Sanday's Start Point Lighthouse in the background. Both animals were viewable from the comfort of the observatory's bar and patio as they swam slowly around Twingness and off to the east. August began with nothing new to report, and just the Greenshank by way of noteworthy species.